The Pennsylvania Office of Open Records has ordered the Department of Education to release copies of contracts that involve Louis Freeh’s law firm. The Dec. 28 order by Appeals Officer Audrey Buglione also said the department can’t claim that it’s allowed to withhold the records under other exceptions listed in the state’s Right-to-Know Law. “The Department failed to provide evidentiary support for the exemptions and privileges it asserted and, accordingly, did not meet its burden of proof,” Buglione wrote in her opinion. The order came after three failed attempts to obtain agreements with Freeh’s law firm from the Department of Education since September. 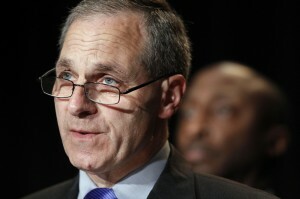 Secretary of Education Ron Tomalis, the Penn State trustee who co-chaired the committee that oversaw Freeh’s investigation, has said he is the most likely person at the department to have the documents. His attorneys denied each request for contracts “to which the law firm of Freeh Sporkin & Sullivan, LLP, is a party” because they weren’t specific enough. But the OOR disagreed, saying enough information was provided for the department to look for the records. It chose not to. “The Department does not assert that it is unclear what is meant by ‘contracts, memorandums of understanding, letters of intent and any other agreements, regardless of title’ or claim an inability to discern what is meant by ‘is a party,'” it wrote in its ruling. While the OOR roundly rejected the department’s arguments, it said it didn’t have to release records “that document personal transactions, business or activities of individuals.” The OOR previously ruled that records of Tomalis’ trustee activities are not subject to the RTKL. That ruling is being appealed to the Commonwealth Court. The department has until Jan. 27 to release the records, prove it doesn’t have them or explain why they’re not public records. Gee, weren’t concerned citizens asking the Board of Trustees about these at the last few meetings? That Board, eh? They really should listen when alumni offer their “expressions”!! Nice job, Ryan, bravo! I trust you will post the contract here when you receive it. If these things are true, it seems the investigative technique may not be above scrutiny, however, a massive coverup had been taking place for years, so the findings are largely the same. I believe the Freeh Report accurately revealed several participants in the coverup and the pure maliciousness of the conspiracy. But this isn’t the end of the story. There are many others whose intentions should be exposed – so instead of shredding everyone who tried to get to the truth – lets work towards getting there.